Creatures of Leisure surf accessories are great. They keep you performing, keep working, and keep looking good through everything you and the ocean throw at them. The Creatures philosophy is simple – best quality, best design, best result. Only the best quality components and materials are used. Their products are high performance, pro style, and durable. They come mostly with multi year warranties. So you get great surfing and long life from your Creatures surf accessories. The Creatures range is comprehensive so every aspect of your surfing gets benefit. Tangle-free leashes, super-traction grip, Surf Ears, lightweight super durable board bag protection, auto accessories, and accessories you didn’t even know you need! They all work together so you get the best surfing life. Patents, granted and pending, are an official acknowledgment that Creatures products and designs are unique, more useful, a better way of doing things. A patent also means Creatures brings them to you exclusively. Mick Fanning has a major role in ownership. So when you use a Creatures product you’re surfing with features and functions refined from decades of competitive surfing experience. You directly benefit from the extensive insight it took to win three World Titles. Full featured warranties, many of them multi-year, mean you get more life and more safety from your gear. So you’ve got a brand that stands behind you. Creatures are innovators. If it doesn’t exist they’ll make it. Based in Western Australia, traditional legropes couldn’t stand up to their local Yallingup conditions. So they created their own, the world’s first urethane injection leash. It’s the foundation of all modern leashes and you get the most advanced benefits from the creator. How does Creatures better your surfing? There’s a Patent Pending on their DNA Flex Mould. So what makes this useful? It’s an answer to the problem of leash breakage, an answer no one else has come up with. It strengthens your leash at its weakest point, where the cord joins the cuff and rail saver. So your Creatures leash survives bigger beatings, lasting longer, saving dollars, saving you and your board from potential disaster. Non-slip cuff. A pending patent, gives you comfort as there’s no abrasive rubbing on your leg. Equally important, it prevents the leash cord moving, a major cause of tripping. So the chance of a fall and nasty wipeout are greatly reduced. The Stainless Steel Bearing Swivel, now common to all leashes, is also another of Creatures’ world firsts. Their latest version is better, self lubricating so is always spinning. You won’t blow a wave because of leash tangle. While there’s a huge amount of technology goes in to giving you the lightest board, what happens when you stick a heavy water-soaking grip on it? That lightweight benefit is lost. Creatures of Leisure Lite is grip that’s light. It’s less water absorbent and also rash reducing. So adding it to your board enhances your high performance. Why not also make your leash light too. Leash Lock is Creatures marine grade ultra light Velcro, much lighter than traditional Velcro and 50% stronger. It’s noticeably higher quality and makes it pretty much impossible for your leash to come off your foot until to want it to. So matching Creatures Lite grip and light Leash Lock leashes gives you lightweight high performance surfing. Diamond-tech is another Creatures exclusive. It’s a purpose designed material to give your board the best all round boardbag protection. Diamond-tech boardbags are lighter, UV and high temperature resistant, hydrophobic, super durable and abrasion resistant. They do everything they can to protect your board, your biggest surfing investment. When you want to enjoy waves travelling away, turn board carrying from a chore into a joy. Diamond-tech multi board bags, wheelies, and the Modular Packing System radically change your travel experience. The Modular Packing System is another Creatures innovation. It’s a set of straps, pockets, and layout on the inside of your board bag. 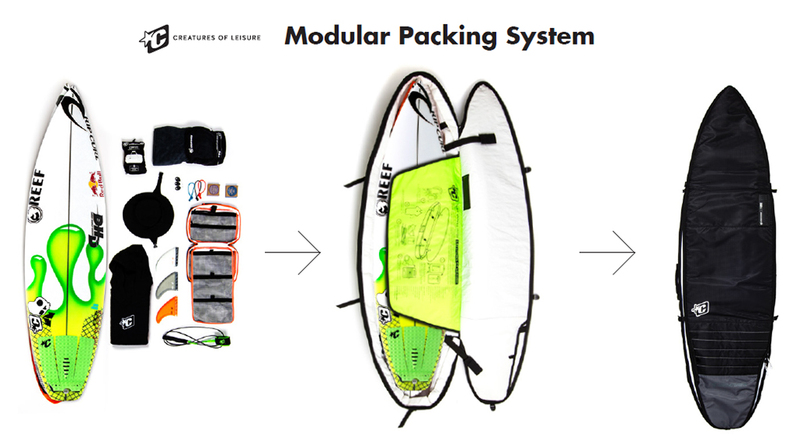 This design and approach makes packing, unpacking and accessing all your surfing gear, super easy. Creatures of Leisure quality is pervasive and brings benefit to every aspect of your surfing. Look closely and you can see depth of detail, depth of quality, the depth of innovative design in everything they do. There’s so much more to Creatures’ product set that we haven’t mentioned here. Whether it’s your SUP, you or your kids bodyboarding, Creatures has it all covered. Their dedicated SUP and bodyboarding products are feature rich just like their surfing gear so you get the best surf experience. Maximise your surfing with the best surf accessories from Creatures of Leisure. To check all our great Creatures of Leisure gear and buy online click here.